First Dance is Perfect for your Wedding! First Dance was in the First Round of the 42nd Annual Grammy Awards Nominating Ballot and Entry List for Best R&B Song. 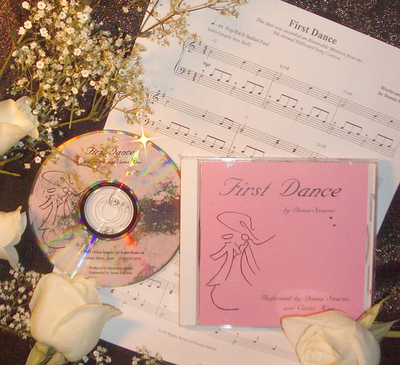 First Dance also won Honorable Mention in the 9th Annual Billboard Songwriter's Contest First Dance placed in the top 500 out of over 20,000 entrants in this prestigious popular music contest. First Dance was written by Donna Stearns, and was performed by Donna Stearns and Curtis King. The CD single has both a vocal and instrumental version of the song. First played at Donna's wedding, it has been loved by everyone who hears it. The lyrics speak to the special love a newly married couple share, telling about the little things which all brides and grooms share and delight in. As a happily married man once said, "The secret to marriage is finding the Joyous in the Everyday." We hope you enjoy First Dance. Please contact us if you would like to sell First Dance retail. I never knew things would turn out this way. And thought love would pass me by. Near home and work and through friends. A love that proved so right. This is our First Dance. I'm dancing with my bride. This is our First Dance. The first, as man and wife. We've got a love that grows and grows. This is our First Dance, for the rest of our lives. Nobody else can make me laugh like you can. with code words and pet names. We've made memories, my darling. We've put old loneliness behind. And best chapter of our lives. What They All Are Saying! First Dance was in the First Round of the 42nd Annual >Grammy Awards Nominating Ballot for Best R&B Song of the Year. It also won Honorable Mention in the 9th Annual Billboard Songwriter's Contest! First Dance placed in the top 500 out of over 20,000 entrants in this prestigious popular music contest. A truly beautiful and moving song. The trick is to write about the Very Personal in a way that makes it Universal so that it touches everyone in a Very Personal way. Donna has done this wonderfully in First Dance. It touches you. It's in the style of Celine Dion and Peabo Bryson's "A Whole New World." Every bride who hears it will love it. ---Jason Kendall, New York Theatrical Director and Producer.